For many guests, those early morning wake-up calls for breakfast at The Crystal Palace, countless monorail, motor coach, and bus rides, and the strong Florida sun mean an inevitable, dreaded afternoon slump. Although some battle this sluggish feeling with a ride down Splash Mountain or a sugary treat (or three), sometimes the only appealing thing is a nice cup of coffee. As a self-proclaimed coffee-fiend, I’ve shelled out my countless Disney Dollars for some java – sometimes to better results than others, so I thought I’d share what I’ve found. This list includes my favorite options both in and out of the theme parks (each link will take you to a comprehensive list), so I’d love to hear where you get your coffee fix in the comments! 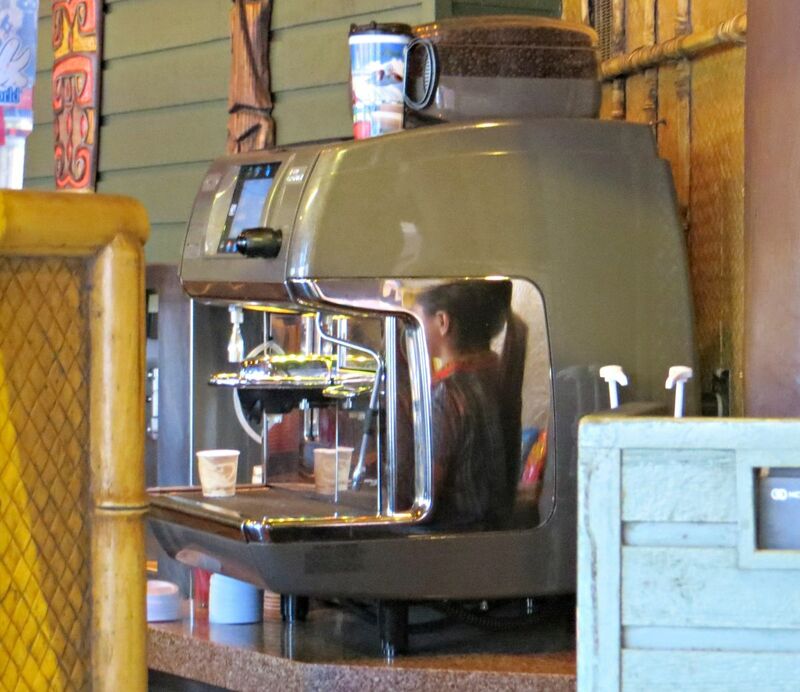 Espresso Machine at Sunshine Tree Terrace. Iced Coffee Float ($4.49) at Sunshine Tree Terrace or Sleepy Hollow Refreshments – as more ‘minor’ menu items compared to the signature headlining snacks and refreshments, the Iced Coffee Float is a decadent treat more suited for cooling off in the afternoon or enjoying during the evening, but if you want one early in the morning, why not? This coffee confection features soft serve ice cream served in a clear cup with French Vanilla, Mocha or Latte flavored coffee (from a machine). Cappuccino Smoothie ($4.49) at Auntie Gravity’s – this frozen concoction takes the form of melted coffee ice cream – milky and smooth, it is served alongside other fruity flavored treats in Tomorrowland. Anything at Main Street Bakery – as the first Starbucks location at Walt Disney World (whether you like it or not), this location delivers a variety of coffee drinks – from their signature Frappucino to a plain ol’ cup of joe for the low price of $1.99 (tall, 12 oz). Bonus at this location? Drinks can be purchased as “snack” credits with the Disney Dining Plan or with Starbucks gift cards (in addition to other standard forms of payment, i.e. cash, credit cards, Disney Gift Cards or Room Charge). 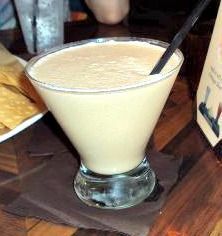 Coffee Mezcal Margarita ($14.50) at La Cava del Tequila – certainly one of the more interesting mixed drinks you will encounter at Walt Disney World, this is a taste sensation you have to taste to believe (only if you are 21+, of course)! Espresso Affogato ($9.75) at Gelato Cart (Italy Pavilion) – a different kind of twist to a coffee float, this Italian treat features hot espresso poured over two scoops of creamy vanilla gelato, garnished with chocolate coffee beans. 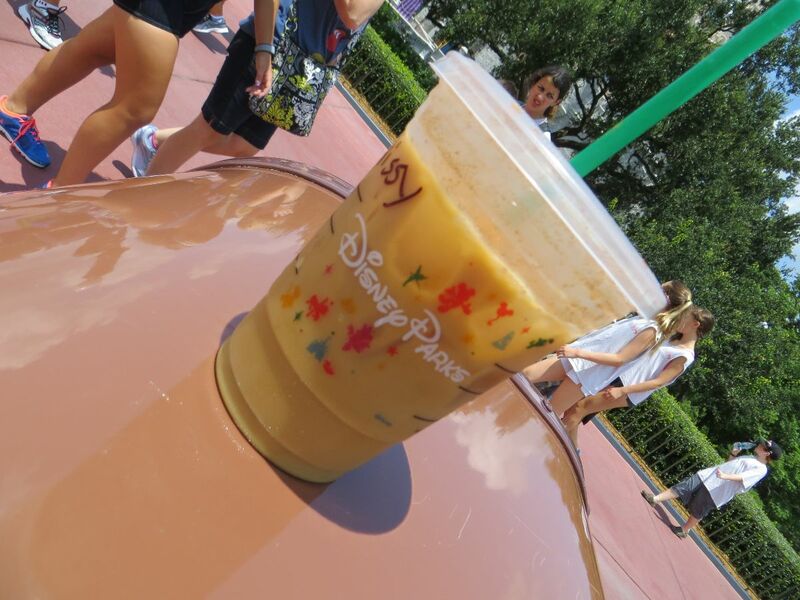 Flavored Latte ($5.39) at various Joffrey’s Coffee locations (4 locations in the park, one outside near the monorail station) – sprinkled amongst both Future World and the World Showcase, these coffee carts feature a variety of coffee drinks, from drip to espresso. I like their lattes because espresso is actually pulled from the machines, not made from a mix. Cappuccino ($3.39) at Writer’s Stop – tucked away between the Sci-Fi Dine-In and the Streets of America, the Writer’s Stop is a great place to take a break. I enjoy drinking a cappuccino made just for you and served in a real cup – maybe even accompanied with their signature item, the carrot cake cookie. Snowball ($8.25) at Yuletide Cheer (Studio Catering Company High Octane Refreshments) – although this option is only available during the holiday season, it certainly is worth the wait. Kahlua, Irish Cream, Amaretto and Half and Half are blended and topped with Whipped Cream for a festive beverage to enjoy while experiencing the Osborne Family Spectacle of Dancing Lights. Frozen Chai ($5.39) at Royal Anandapur Tea Company – although this location does serve coffee (hot and iced, as well as espresso drinks) I have to admit that even I order tea when visiting here. All drinks can be prepared with whole or skim milk and are best enjoyed on the terrace below. Animal Kingdom Souvenir Mug ($4.89) at Restaurantosaurus – this mug can be filled with soft drinks, hot cocoa or coffee, but the plus for this location is the self-serve drink station…so long story short: quantity over quality if you really need a big boost! Frappe ($3.99) at Kouzzina by Cat Cora – I first read about this drink after reading my friend Amanda’s blog – their frappe is a shaken coffee drink with coffee, milk and natural sugar. Definitely a must-try! Press Pot African Coffee (included with meal) at Boma – this coffee is a special roast available only at Disney’s Animal Kingdom Lodge. 100% Kona Coffee – French Press Pot ($7.49) at Kona Cafe – although the menu notes that this is “for two,” I have definitely have enjoyed this on my own while enjoying a fresh made breakfast of Tonga Toast! Anything at Contemporary Grounds – this location serves a variety of gourmet espresso drinks (prices range from $3.39 for a coffee to $5.39 for a frozen cappuccino). Of course, if you are looking for a plain ol’ cup of joe (regular or decaf), you can find it at most quick service locations for $2.19, so on your next Walt Disney World vacation, you’ll be sure to find what you need, no matter your taste or budget! Where do you get your coffee when visiting Walt Disney World? Ohh! Great article!! 🙂 Looks like the Starbucks at Epcot is opening any day now. Can’t wait! It’s artsy because it’s tilted. What about counter service locations in/around Boardwalk and Beach/Yacht Club? Two years ago, I nearly went insane trying to find a morning takeout coffee anywhere in that vicinity that wasn’t that putrid brown water called Nescafe. I would also like to know if they replaced that horrible Nescrappe with Joffrey’s yet. Getting a Rapid Refill mug on our trip in Oct may depend on the answer. Good point… I never even considered getting a refillable mug because of that Nescafe swill. If they’ve changed to Joffrey’s, I’m definitely investing in one for our next trip. Awesome news! Thank you for the top-notch research! Thanks for writing back and thanks for the research. That frappe at Kouzzina looks amazing! Like the real thing I had in Athens, Greece several years ago. Cat Cora’s Greek heritage shines again! Isn’t Kouzzina awesome? Ahh, I love it! My wife and I have had some excellent coffee drinks at the Tangierine Cafe (the counter-service restaurant in Morocco). They use a real espresso maker there (and always have), but not many people know about it—check out the menu at the pastry counter. Thanks for stopping by and sharing, JeffK! I have had some adult beverages from Morocco before but never the coffee ones, def a good recommendation! One of our favorites is the stand at the exit of ToT in Hollywood Studios. I’ll have to check that out next time I’m at DHS! Thanks for sharing, JoAnn! Ohhhhh the frozen chai at Animal Kingdom. I’ve gone countless times and only discovered it this summer when I was desperate for a cold treat one afternoon. Heaven. Cold treats definitely taste even better when visiting the steamy AK! Thanks for stopping by!! You had me at waffles…then marscapone….honey…AHHH must go to Kouzzina NOW. I really hope the Nescafe is switched to Joffrey’s by October! I can’t stand that stuff. I think i’m going to bring my mini Keurig to the room 🙂 I will def. 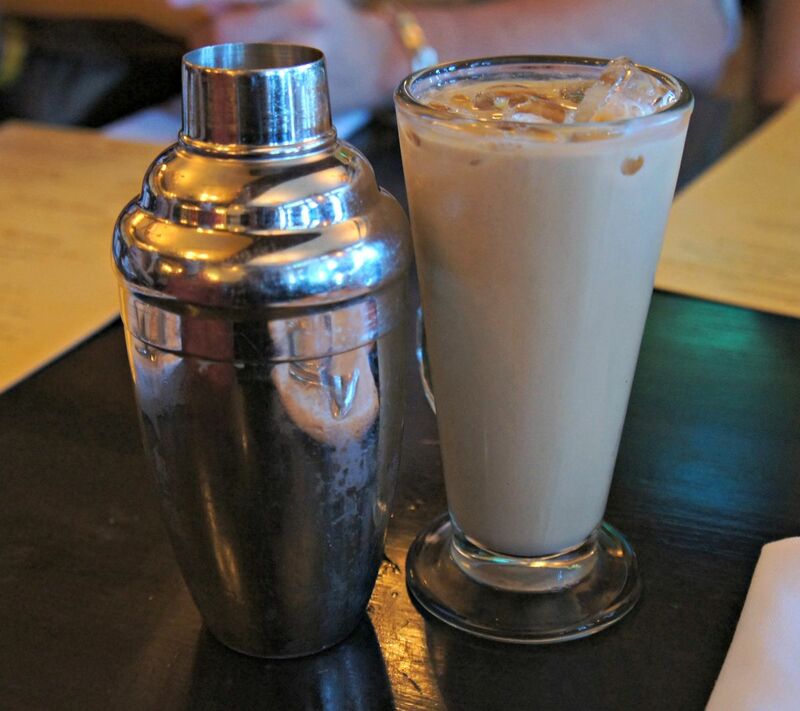 try some of these interesting coffee concoctions as well!